There's more to do in Redondo Beach than just walk along the sandy fringe where it meets the Santa Monica Bay. You'll find plenty of things to do there, whether you're going for a day or looking for a weekend beach getaway. However, most of it is in the area centered on the Redondo Beach marina and pier. If you only have time for one thing to do in Redondo, go to the Beach. 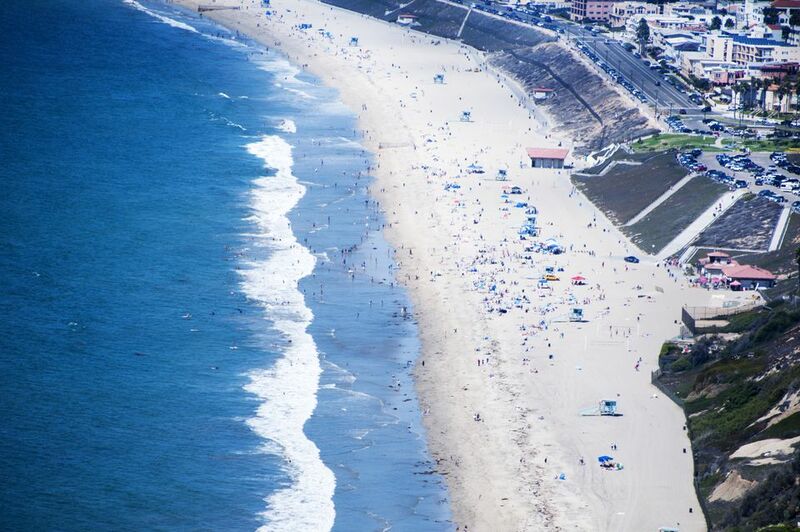 The sandy part of Redondo Beach is just south of the pier. Lifeguards are on duty here, watching kids and adults alike bobbing around in the surf. Redondo Beach Pier: The U-shaped Redondo Beach Pier bristles with fishing poles, and once in a while you'll see someone reel in a catch. You'll also find restaurants and fast-food stands. There are plenty of souvenir shops, too, one of which touts a 16-and-a-half-foot long great white shark on display (which is, thankfully, dead). Rent a bicycle: You'll find Marina Bike Rentals on Harbor Drive north of the pier. They have a bike path map on their website and can give you some ideas. The oceanfront bike path is flat and runs for more than 20 miles up to Santa Monica. Or take it south from the pier to the Riviera, grab a bite to eat and bike back. Sportfishing: Half-day and longer deep-sea fishing trips leave from the marina. No pole? No problem. Rent equipment at the tackle shops nearby. Catches around Redondo Beach include halibut, mackerel, bonita, sand bass, and yellowtail. Rent a kayak or paddleboard: The marina and nearby harbor offer plenty of room to paddle around in the protected water and lots to see. Take a speedboat ride: The Ocean Racer is a 70-foot, 140-passenger speedboat. It blasts off hourly on weekends and holiday afternoons. Head for the riviera: Some people say this six blocks of unique, local shops, salons, and eateries resemble southern France. We wouldn't go quite that far, but it is very appealing. You can get there by walking along the oceanfront sidewalk south from the pier, driving south from the pier on Catalina Avenue or taking Beach Cities Transit bus #109. Go for a swim: You can swim in the ocean, but if you like your water calmer, Seaside Lagoon offers a salt water pool with sandy beaches. Watch the grunion run: No, this isn't a 5K or a 10K. Instead, it's the mating spectacle of small, silvery fish that spawn en masse on southern California beaches shortly after high tide shortly after a full moon. The peak spawning period is late March through early June. You can park in the lot at the pier and with street parking nearly nonexistent in the area, it's the easy solution. Many of the businesses on the pier will validate your parking. The Redondo Beach Farmers Market takes up many of the parking places in the lot south of the pier on Thursday mornings. You'll find public restrooms on the pier and above the oceanfront sidewalk south of it. From May through July - but most often in June - Redondo Beach can be shrouded in fog all day. Spring and fall are usually beautiful. So is winter, as long as it isn't raining. Go early in the day for a quiet walk on the beach or later to enjoy the people. If you go at night during the phenomenon called Red Tide, you might even see an eerie green glow in the waves. From LAX, take the scenic route to Redondo Beach. Go west toward the ocean on Imperial Highway to the end and turn left (south). From there, all you have to do is follow the beach as closely as you can as you drive through Manhattan Beach and Hermosa Beach on your way south. From I-405, take Artesia Blvd. west to Pacific Coast Highway and go south. Turn right on W. Beryl St. to reach the marina. The Redondo Beach Pier is at Torrance Blvd. Continue south on Catalina Avenue to arrive at the Redondo Beach "Hollywood Riviera" area.